Only a few more days until Halloween. Are you getting ready ? There is so much to think about and we are starting to get nervous as well. How are we going to dress up ? Where are we going to go "Trick or Treating" ? Who is going to prepare the best blood soup ? When are we going to create the pumpkin head ? At our offices, everybody is frenetic about this special day and we have talked about it over and over. Camaloon, too, is infected with the hype and is trying on a different outfit every day. 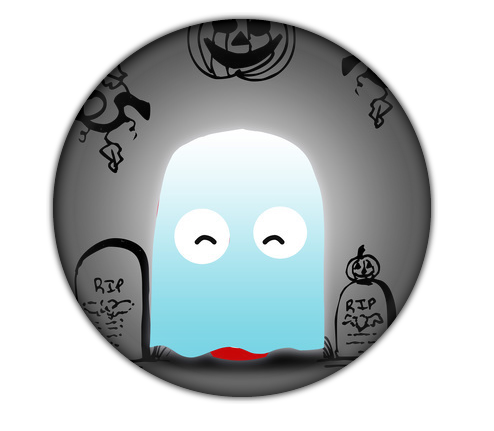 You can buy this cute button directly in our gallery. It glows in the dark for a special Halloween effect! Here you can see Camaloon dressed up as a ghost. Would you have recognized him ? Talking about the new outfits we have come to ask ourselves where the Halloween tradition comes from and there are so many different explanations. The Halloween fest as we celebrate it today on October 31st is rooted in the Western European tradition of the harvest festival at the end of the summer season. Farmers ended the summer with a huge load of fresh cereals and celebrated the full stock they now had. With the Harvest Festival they gave thanks to the richness of mother earth. This makes a lot of sense but the question about our dresscode still remains...Why do we dress up as scary monsters or ghosts ?